Hands down, the most unusual brewpub in Portland is Tugboat Brewing Company, hidden away on a downtown alleyway which is actually a disconnected stretch of Ankeny between Broadway and Park. It's a small 4-barrel operation that's been there since 1992, but it's a well-kept secret. When I ask people if they've ever been there, the few who have usually add, "Is it still there?". It's a quiet existence: they don't advertise or participate in beer festivals, the website appears to be at least 5 years out of date, and their ales are only available at the pub. Their opening hours are pretty limited, basically 4 PM to midnight every day. In a state where all the brewers seem to know each other -- and many have reputations spanning multiple breweries -- Tugboat isn't even on the Oregon beer family tree. That's not at all to imply that the owners are arrogant or unfriendly -- in fact if the brewer or his wife isn't behind the bar, they're probably having a beer at one of the tables. 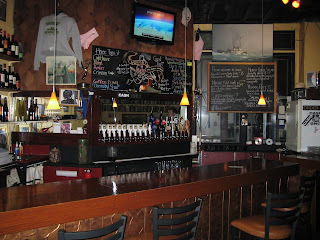 The obscurity is part of the charm of the Tugboat, and it's definitely worth a visit. It's a comfortable, cozy place. 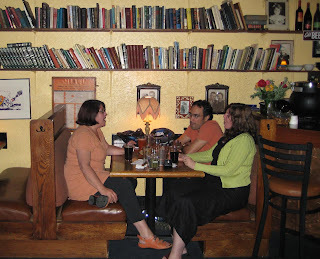 The walls are lined with used books, and you'll usually see the people at one or more of the tables enjoying a quiet game of cards or board game. Smoking is allowed, but the ventilation seems pretty good. I always smell the smoke when I'm there, but it's not thick enough to stick to my clothes. "Coffee Brown" is just named for the dark-roasted color, there's no coffee in it. Chernobyl is definitely the most distinctive beer, the one I seek out every time I'm there. It's a big one -- over 10% ABV, only served in half-pints -- tasty and black, though last night it seemed a little too flat. None of the other ales seemed like they were terribly strong, you could comfortably have a few of them. They also had eight guest taps last night, plus a cider. Three of the guest taps stood out as being pretty rarely sighted in these parts: Klamath Basin 8 Second Ale, Leavenworth Blind Pig Dunkel Weizen, and Off the Rail (no website?) Over the Mountain Stout. I like to award imaginary community service points to places that have obscure guest taps, like when I found Klamath Basin beers at SuperDog. Tugboat gets double points, for supporting Klamath Basin and Off the Rail, the brewery with the excellent Ozzy/Black Sabbath beer names. Guest pints are $4.50 ($4 happy hour). Tugboat might get a little more exposure to beer fans now that Bailey's Taproom -- the westside's attempt at Green Dragon coolness -- has opened across the street. It chugged along before that for many years, and hopefully will for many more. If you're downtown of an evening, stop in for a pint or a nuclear stout. Bill - I totally used to hang out there when I was in Grad school - the professors turned us on to the happy hour. Sadly, I haven't been there since 2000... Is there still a big archidork crowd? Jill: None of the patrons were noticeably architectural. But they might have been, because a big crowd filed out about 7 PM when the prices went up 50 cents. Another parallel in the lives of Jill & Dave: I also have not been to Tugboat since 2000. We should totally get married and have a kid. Aw Dave, you've been to the Tugboat with me before, that was probably 2003 or 2004. But don't let that brief visit get in the way of your marriage and reproductive activities. Oops...too late, already married and kiddified. Off The Rails no longer exists hence the no website detail. Corey, I also thought OtR was finished, but when I mentioned that to the Tugboat bartender, he said, "No, I just talked to [lady's name] there today, haven't heard about them shutting down." It's very fitting, the pub everyone thinks is closed, serving beer from a brewery that everyone thinks is closed. Maybe I dreamt it all. Is that a bottle of Port Ellen I see behind the bar? I love Tugboat. Then again, I work a few blocks away. Have you noticed the pervasively pungent Grapefruit aroma that permeates each of their beers? I have taken several friends there and they all have picked up on it with some prompting. Am I crazy? Also, they are a great growler value if you arrive during happy hour: $10 for a fill. Dave S: Maybe your grapefruit aroma is what we were calling "yeasty". Next time I'm there I'll close my eyes and think about grapefruits.